“Louis Renault who was a Boarder here in 1911 joined the French Army at the beginning of the war, and had been promoted to Sergeant. So far your Editors have been unable to trace any further details of Louis Renault. However, according to the Farnhamian of August 1917, he was serving with the French Army. He is commemorated on the School’s War Memorial. So far your Editors have been unable to trace any further details of A. Reynolds. He is commemorated on the School’s War Memorial. The death of William Bastow was not announced in the pages of the Farnhamian. Second Lieutenant William Bastow was serving in the Royal Naval Air Service. The Commonwealth War Graves Commission records his death as having taken place on 26 November 1915. He is buried in the Lancashire Landing Cemetery, in section K 53, and is commemorated on Farnham’s War Memorial in Gostrey Meadows. For reasons that are still unclear, his name does not appear on the School’s War Memorial. William Bastow was born on 23 August 1894. His family lived in the White House in West Street. He attended St Polycarp’s School, moving to Farnham Grammar School in 1904. He left in 1909 and was only 21 years old when he was killed. Before the war he held a responsible position in Malaya and then spent three years training in the Hants Carabiniers. He had a keen desire to fly and entered the flying service, becoming attached to the Royal Naval Air Service. He became an expert aviator and rendered valuable service. The Surrey and Hants News (December 1915) reported that he had been accidentally killed whilst serving with the Mediterranean Expeditionary Force. In the June 2009 issue of the Farnhamian, Cyril Trust, the OFA’s historian, wrote a short article on the School War Memorial, noting that of the 71 Old Boys who died, only 20 of these names are shown on the town’s War Memorial in Gostrey Meadow. Cyril went on to provide some biographical information on some of the Old Boys who fell in the Great War, partly based on on research published in Henry Ellwood’s Remembrance Books, copies of which are held in Farnham Museum. Checking Cyril’s entries against the School’s Memorial revealed that William Bastow’s name was missing. This raises the question as to how and why William Bastow’s name was omitted from the War Memorial when, at the time of its unveiling, there must have been members of staff and Old Boys who remembered him. It appears that his family left Farnham shortly after the end of the war and emigrated to Australia. We can only speculate that this move meant that William’s name was never included on the school’s memorial. On Saturday 8 December 2018 a short ceremony was held at Farnham College to unveil William Bastow’s name, which has been added to the School War Memorial tablet. You can read an account of this here. 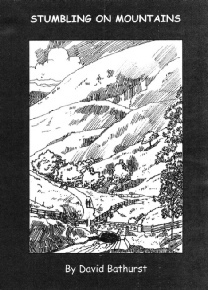 The booklet produced for the ceremony includes additional information on William Bastow and his family, which can be downloaded here (pdf format). Gerald Copeland was serving in the 1st/15th Battalion of the London Regiment (Prince of Wales’ Own Civil Service Rifles). The Commonwealth War Graves Commission records his death as having taken place on 11 November 1915. He is commemorated on the Loos Memorial, panel 132, and on the on the School’s War Memorial. “Lieut. H. Keable who spent eight or nine happy years here [at Farnham Grammar School]. Of the death of Keable alone have we any particulars, and those who knew him will be proud to hear them, as will also those to whom he is only a name. The short details are doubtless typical of the others and indeed of all who have given their lives for us. Harold Keable was serving in the 8th battalion of the Royal Berkshire Regiment. The Commonwealth War Graves Commission records his death as having taken place on 25 September 1915, aged 26. He is buried in the Bois-Carre Military Cemetery, in section F. 30, and is commemorated on the on the School’s War Memorial. Harold Keable was the son of Charles Henry and Constance Mary Keable. They lived at “Parkleigh”, The Fairfield, Farnham. David Bathurst has been in touch with the Editors drawing our attention to the publication of his first novel in October 2015. “Stumbling on Mountains” is a heart-warming and inspiring story that will be enjoyed by anyone who has a love for the great outdoors and its power to change lives for the good. All the proceeds of the sale of the book are being donated to the Sussex Snowdrop Trust which helps families of seriously ill children in Sussex by giving financial support, practical care and specialist equipment to meet their daily needs. Copies cost £10 each (post free) and may be ordered direct from David via davidbathurst at btinternet dot com. We have added further details of David’s book on our Publications page. 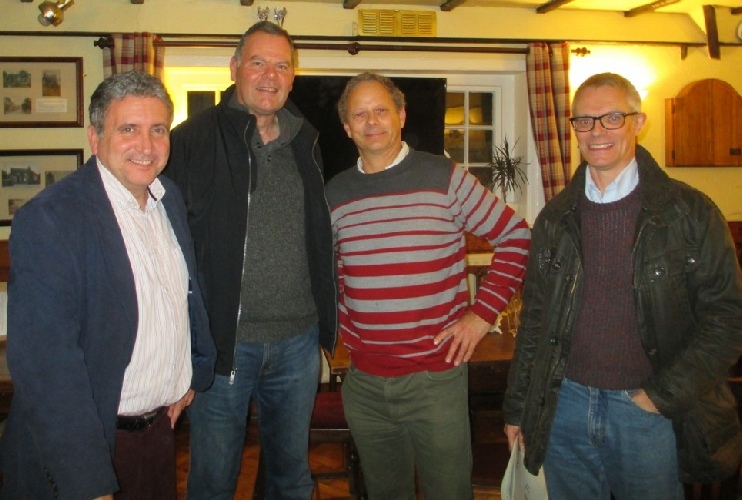 Following our October 2014 get-together in the “Hop Blossom”, Farnham, celebrating what would have been John Saunders’ birthday, we held a similar event on 17 October 2015. This year we decided to visit the “Good Intent” public house in Puttenham. This year’s attendees included Mike Mehta, Chris Nelms, Tim O’Dell and Julian Walden. We plan to retain this very informal get together as a regular annual event, hoping the date we choose suits most people. Details of the 2016 meeting will be posted on Blunderbuss in due course. Our 2015 October Meeting: left to right: Julian Walden, Chris Nelms, Mike Mehta and John Clarke. We apologise for the omission of Tim O’Dell from the group photo, but he’d already left! A special lecture on the 800th Anniversary of Magna Carta took place the College on Sunday 20 September. The lecture was arranged to raise funds for the Nepal Earthquake Appeal. Following the lecture, tours of the College buildings took place, led by students from the College. 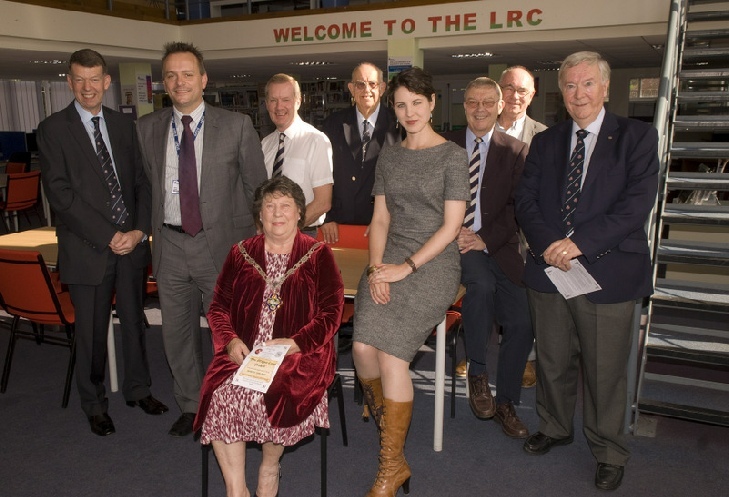 After the Magna Carta Lecture: left to right: Mike Potter, Jason Jones, Stephen Pritchard, Cyril Trust, Dr Sophie Ambler, Roger Edgell, Bryan Bone, Ian Sargeant; seated: the Mayor of Waverley Council. The Farnham Herald reported on the lecture as follows: “The Old Farnhamians’ Association combined with Farnham College on Sunday to present the lecture ‘The Magna Carta Project – uncovering the charter and its world’ by one of the UK’s foremost experts on the subject. “More than 100 people attended the Performance Hall at the college to listen to Dr Sophie Ambler, from the School of History at the University of East Anglia, covering the early days of the charter and some new developments from a small group of top historians in this country. “He did win one battle, but was defeated finally and lost this important part of his kingdom. Findings show that his treatment of enemy prisoners and people who plotted against him was often locking them away and letting them starve to death. “Eventually the barons of the realm could not accept this treatment and teamed up to force the king to agree and sign a new set of laws for all, including royalty. This was the first sign of Magna Carta and John was forced to sign it at Runnymede in 1215. “The charter was amended a few times over the next few years and a final version emerged when Simon de Montfort led the barons. Battles took place across the south of England and the speaker incorporated Farnham Castle, Shere Church, Guildford and Odiham into her talk. Much of the information was new to the listeners. “There were originally 14 copies of the charter, but only four are known to survive today. One was recently found in a scrapbook owned by a man living in Kent. Are there any more? “The receipts for the event will be presented to the Nepal Earthquake Appeal and it is hoped that more than £1,000 will have been raised. 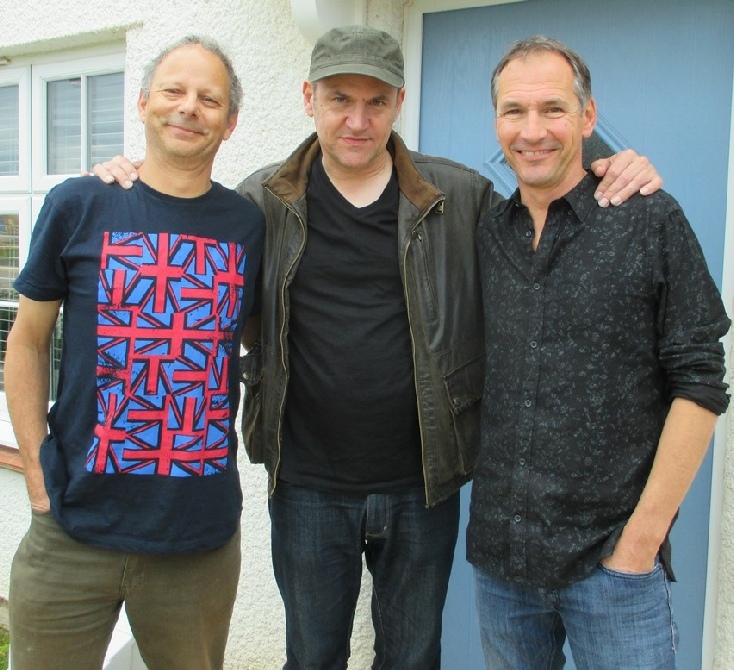 1980s Pop sensation “Strange Arrangement” performed a gig at Taunton Rugby Club on 12 September. Our ever-roving reporter Mike Mehta was there swinging his pants and caught some of the band on camera the following morning, ie Geoff (vocals) and Phil Hoegger (keyboard). Phil was at Farnham College (1977-1979). Mike’s T-shirt is from Colour Blind Are Us. 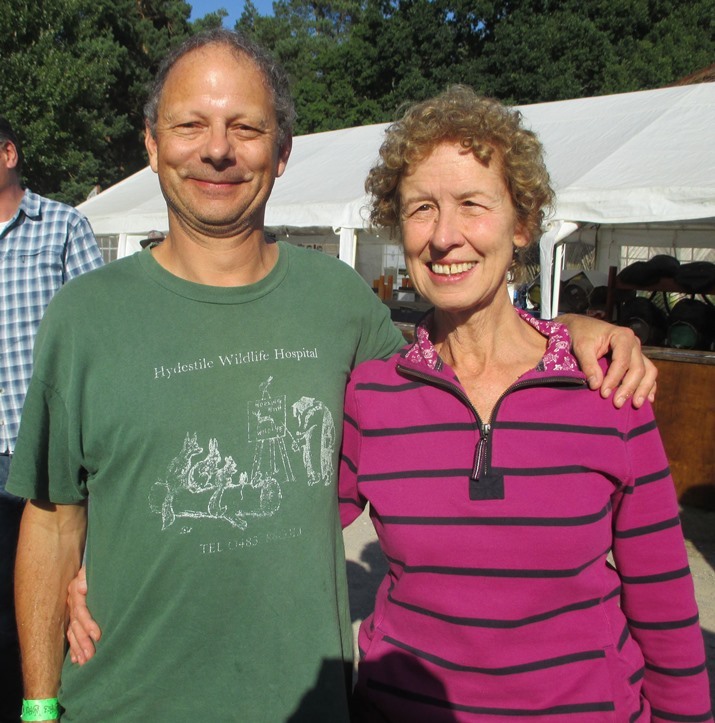 This year’s Weyfest featured Old Boy Chris Nash and former member of staff Jenny Commerford. Jenny was a Festival volunteer, but Mike managed to grab this photo during her time out from her duties. Lieutenant E. Birkbeck was serving in the 128th Indian Pioneers. The Commonwealth War Graves Commission records his death as having taken place on 7 August 1915. He is commemorated on the Helles Memorial on panel 263 and also on the School’s War Memorial. 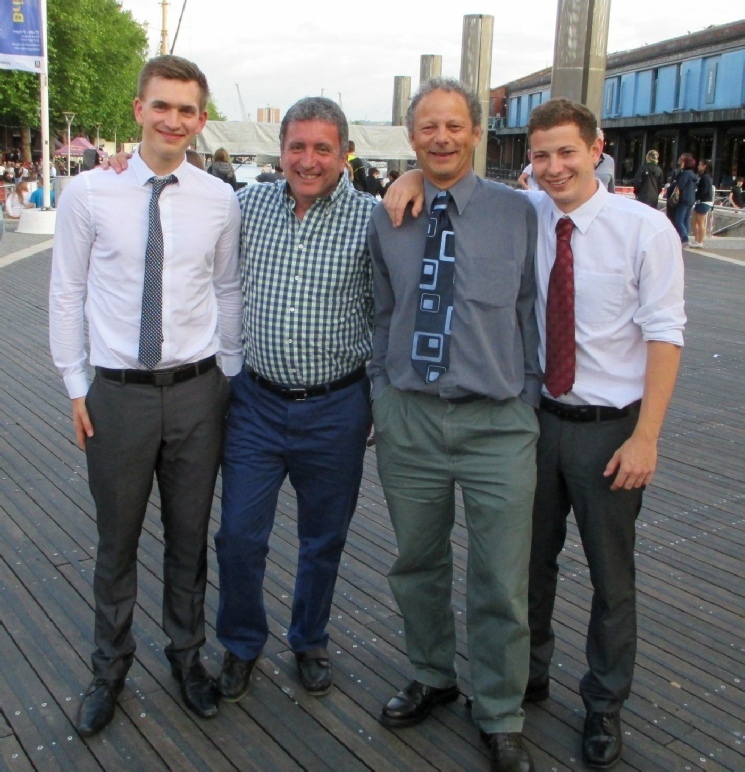 Proud parents Julian and Mike celebrated a double degree day in Bristol on 17 July. Ross Walden graduated in Aeronautical Engineering, and Josh Mehta graduated in Chemistry. 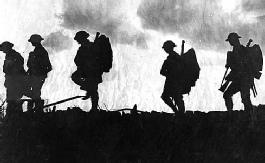 Arthur Talbot was serving in the 2nd Battalion, Essex Regiment. The Commonwealth War Graves Commission records his death as having taken place on 17 July 1915, aged 20. He is buried in the Boulogne Eastern Cemetery in section II. A. 35, and is commemorated on the on the School’s War Memorial. Arthur Talbot was the son of Arthur Warburton Talbot and Caroline Eva Talbot. His obituary in the Farnham Herald records that he was a nephew of Colonel Trimmer, who formerly lived in the Bourne, and received the first part of his education at Farnham Grammar School. On leaving Farnham he attended Bedford Grammar School. After passing through Sandhurst he was gazetted to the Essex Regiment. He was badly wounded in the mouth while fighting in Flanders on 1 June. As the Farnhamian subsequently announced, he got weaker and died of his wounds on 17 July. Private Harold Young Bown was serving in the 1st/4th Battalion, Hampshire Regiment. The Commonwealth War Graves Commission records his death as having taken place on 20 June 1915, aged 20 of enteric fever. He is commemorated on the Basra Memorial, panel 21 and 63, and is commemorated on the on the School’s War Memorial. Harold Bown was the brother of Mr E. C. Bown of 49, St Peter’s Avenue, Kettering. 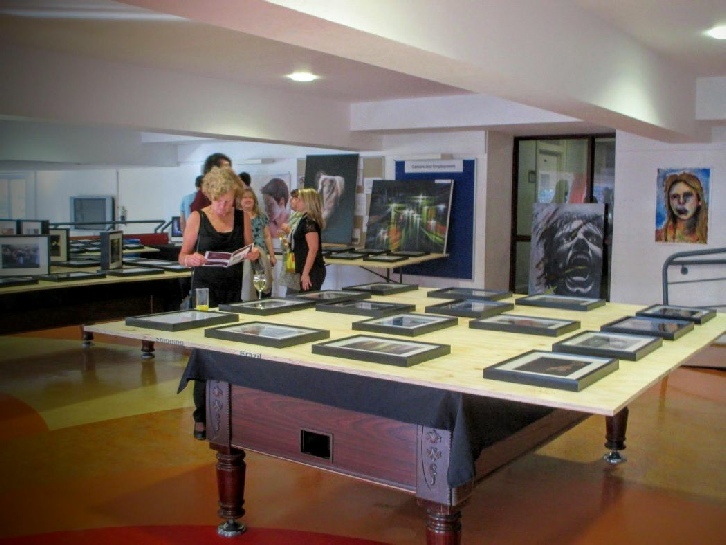 Mike and Jill attended a showcase of student artwork on 18 June at Farnham College. The display was held on the mezzanine floor of what we would remember as the old gym. A fine selection of completed projects was on display as can be seen below. See if you can spot the “mystery shopper” in photo 2! 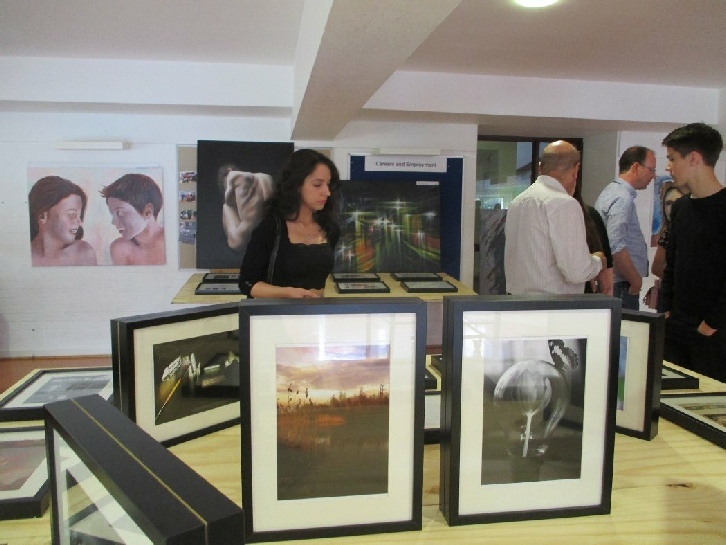 On the 7th June 2015, Tilford's Rural Life Centre held an exhibition celebrating Farnham's St. George’s Primary School. For much of its existence, the school was located in a handsome red brick building in Castle Street. The school was cramped and had no on-site dining facilities and Farnham shoppers became accustomed to the sight of pupils making their way through the centre of town to a restaurant in Downing Street for their lunches. Top year pupils were given the freedom to buy their own lunches, usually at The Castle Coffee House, a stone’s throw away from the school, or at Poppins Cafe in Downing Street. Barbara Wills (wife of FGS art master John Wills), was a class teacher during the period I was at the school and was later appointed as headmistress. Pupils sat their 11 plus entrance exam and some joined FGS, or FGGS. some of the old term reports and enjoyed browsing through the collection of school pictures and sports cups which were on display. There was talk of repeating the exhibition and Farnham Museum's Garden Gallery has been suggested as a possible future venue. 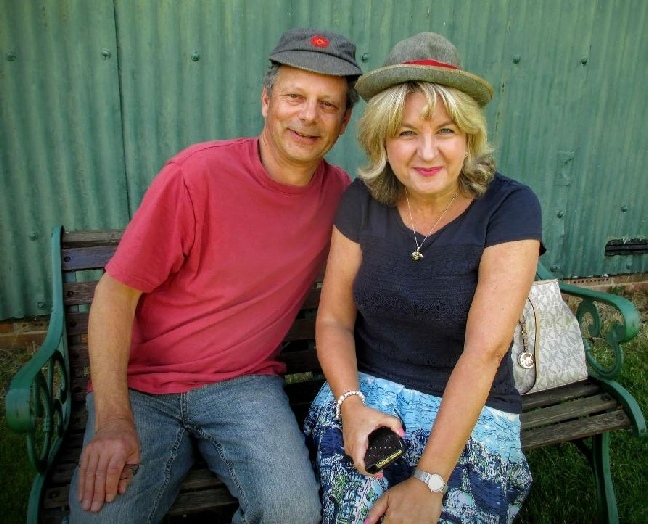 Michael Mehta (1971) & April Jobling (1971) outside The Schoolroom, Tilford Rural Life Centre. A welcome addition to Blunderbuss is this contribution from Richard Bayliss (1972-79) who sent us this photograph following his appearance at the Combined Spring Party. Another successful Spring Party took place on Saturday 16 May at South Farnham School, Menin Way. Over 150 former Grammar School pupils took over the hall at South Farnham School (the former home of the Farnham Girls Grammar School) for a few hours of nostalgia. Guests came from across the country to enjoy the afternoon, which began with a welcome from Patricia Atkinson, the current chairman for the Old Girls. 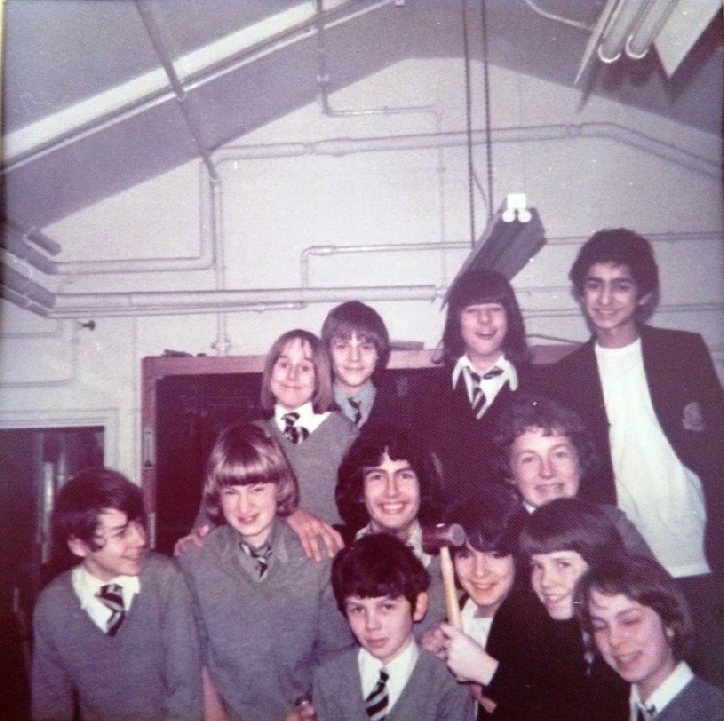 One of the current staff was on hand to take groups around their old school to see the many changes over the years. This was followed by an excellent buffet lunch, mainly laid on by the Old Girls under the leadership of Secretary, Gill Picken. As coffee and tea were served the guests were surprised by a “flash mob” from that excellent local ladies choir, In Accord. A programme of well-known songs was presented. The afternoon was brought to a close by chairman of the Farnhamian 400 Trust, Cyril Trust, who thanked the many helpers, the wonderful choir and the guests for attending. He hoped that the event would be repeated annually and those present spread the word that this was an event not to be missed. Guests included David Bathurst, Richard Bayliss, Mark Bravery, Helen Collett, Georgina Crawley, Martin Collier, Jill Goddard, Rev. Innes, Mike Mehta, Carol Pritchard (McMahon), and Julian Walden. Roll up, roll up and see them all in the slideshow below! Cecil Fitzmaurice was serving in the 69th Mechanical Transport Company of the Army Service Corps. The Commonwealth War Graves Commission records his death as having taken place on 3 May 1915, aged 19. He is buried in the Wimereux Communal Cemetery in section XII. 2, and is commemorated on the on the School’s War Memorial. Cecil Fitzmaurice was the son of D. C. M. Fitzmaurice, a Major in the Lancashiree Fusiliers, and his wife Esther. They lived at 67 St George Street, Portman Square, London. After a 37 year hiatus, [sounds painful! 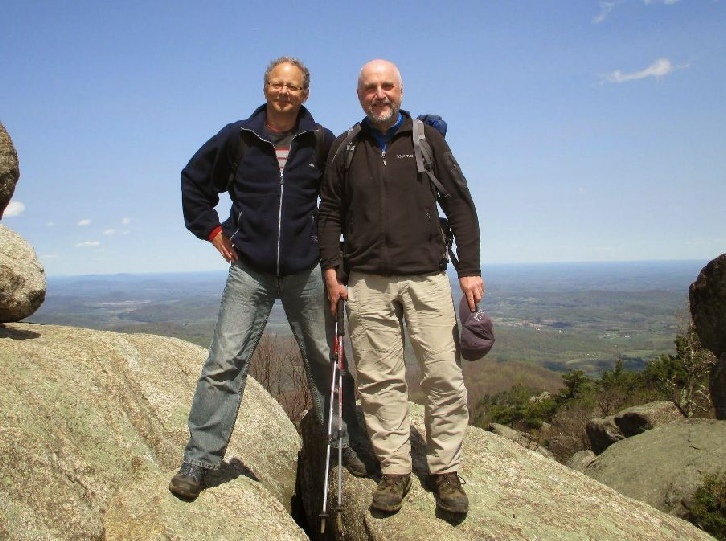 - Ed] Mike met up with Robert 'Mac' McWilliams (1971-78), in Shenandoah National Park in the USA. Mac was keen to pass on his very best wishes to all former staff and fellow pupils who knew him at the former Boys' Grammar School and Sixth Form College. The photo shows the pair of them at the summit of Old Rag Mountain. Major Walter Herbert Paterson was serving in the 1st Battalion, East Surrey Regiment. The Commonwealth War Graves Commission records his death as having taken place on 20 April 1915, aged 45. He is buried in the Bedford House Cemetery in Enclosure No.2 V. A. 39, and is commemorated on the on the School’s War Memorial. Walter Herbert Paterson was the son of Surgeon Major General Henry Foljambe Paterson (1836-1920) who had served in the South African War. On 18 April, Mike Mehta ran in the Blue Ridge Mountains of Virginia to raise funds for the Moon Bear Rescue Project. The run involved a total elevation gain of 1,897 feet and began with a 2 mile climb up Mill Mountain. Due to your generosity, Mike raised a total of £427.50 (including Gift Aid). His time was an impressive 2:09:39 and he was placed 185 out of 841 runners. 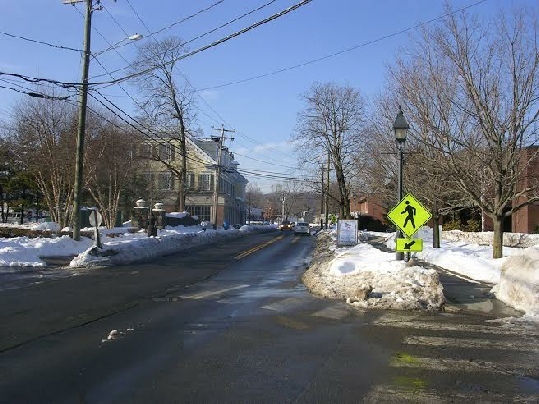 Robert 'Mac' McWilliams has updated us on this year’s weather Stateside. The Farnham Herald dated 16 January included letters penned by Peter Wicks and David O’Brien. “Sir, - Your article last week (“Surrey schools are bursting at the seams”) describes a severe lack of secondary school places in Farnham schools. This must frighten many parents with children about to move up from primary schools. Transporting young children to neighbouring towns will cost a great deal and place huge strains on parents with more than one school age child. I know that my old school, Weydon, is undergoing a major expansion to help cater for this demand. But I am astonished to discover that, at the same time, Weydon School is also applying to expand into sixth form provision, hoping to offer up to 100 new places for 16 to 19 year olds. As a former mathematics teacher at Farnham College, I cannot see the logic of over-providing sixth form places in our town at a time when we have a desperate shortage of school places. Farnham College was always, and remains, an excellent e provider of A-level education with special coaching for those seeking places in top universities (last year two students were awarded places at Cambridge). There is no shortage of places at this time. Sixth form colleges offer an excellent breadth of curriculum; and are a very good intermediate stage between school and university. Keeping older children in schools may seem a comfortable thing to do, but it can be limiting in many ways - a school can only offer a restricted range of subjects. When leaving, the student faces the prospect of moving directly from a day-school environment into university or employment without the experience of two years in college. “Sir, - Who could not have been impressed by the courage of Cobgates residents on the street in wheelchairs defying the chilly weather in Farnham town centre at the weekend asking people to sign their petition to save the care hone from the merciless cutback of vital social care in Surrey. I do not support Surrey County Council’s shortsighted and callous proposal to close all six of their care homes n the county. Indeed, I believe the land at Cobgates in Farnham town centre should be designated as a community asset under the Localism Act specifically for provision for the care of the elderly.